When it comes to the management of pests and diseases affecting your plants, knowledge is power. Diagnostic services can help with identification and assist in tailoring management actions that suit your business; production nurseries are urged to make good use of the detective services they offer. One such service is Grow Help Australia – a service offered through the Queensland Department of Agriculture and Fisheries. This service is heavily subsidised for Australian production nurseries through the levy-funded project Building the resilience and on-farm biosecurity capacity of the Australian production nursery industry (NY15002). Project leader and diagnostician Andrew Manners says even growers who are confident they know the problem can benefit from sending in samples for testing, to confirm their diagnosis as part of quality assurance processes. Results showing that plants are free of pests and diseases are also important and can provide customers with greater confidence that your products are healthy. Growers receive a written report containing a list of tests carried out on each sample, an interpretation of the results, and recommendations based on the specifics of the nursery, plants and pests or diseases detected. Diagnostic services are especially useful for production nurseries that have something unusual going on, are seeing poor plant growth with no apparent reason, or have tried management options that have failed. Dr Manners says it can save both time and money to confirm the identity of the pest or disease causing issues sooner rather than later. Understanding the biology of the organism in question can also allow for more specific treatment and prevention. The Grow Help website provides details of how to submit samples, including collecting, preparing and packaging plants. This will differ depending on the type of plant and what’s wrong with it. Sending plants on a Monday or Tuesday is best so they don’t perish in transport; overnight couriers are recommended, but express post can also be effective. If in doubt about what to send and how to send it, contact Grow Help ahead of time. Please note that all quarantine obligations must be met when sending samples to diagnostic services. An electronic submission form is available and allows for the easy collection of background information about the sample that assists in diagnosing each problem. Once the form is submitted, it is sent to both Grow Help and the email addresses you nominate. 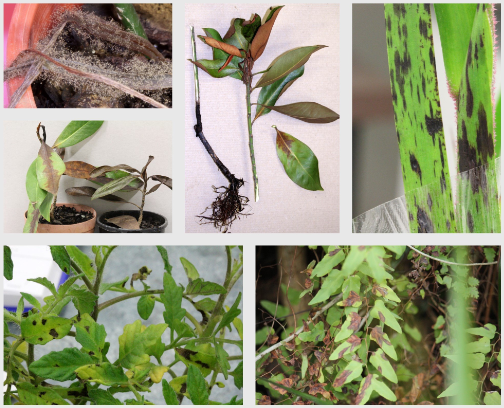 Photos of symptoms can also be sent to the project team to get an initial preliminary indication of what might be affecting plants – ensure that your photos are in focus! Grow Help has recently had its phone number changed. The new phone number is 07 3708 8377. The email address remains unchanged: growhelp@daf.qld.gov.au. Under the levy-funded project, production nurseries that are signed up to the Nursery Industry Accreditation Scheme Australia (NIASA) will receive 10 free tests per year through Grow Help, while other levy-paying production nurseries can take advantage of heavily subsidised testing.